For Obama And Romney, It's Back To The Campaign After Sandy : The Two-Way Both President Obama and his Republican challenger, Mitt Romney, will be out stumping for votes today. The race for the White House, which was just about put on hold as Superstorm Sandy bore down on the East Coast and then roared ashore, is back on with just five days to go before Election Day. 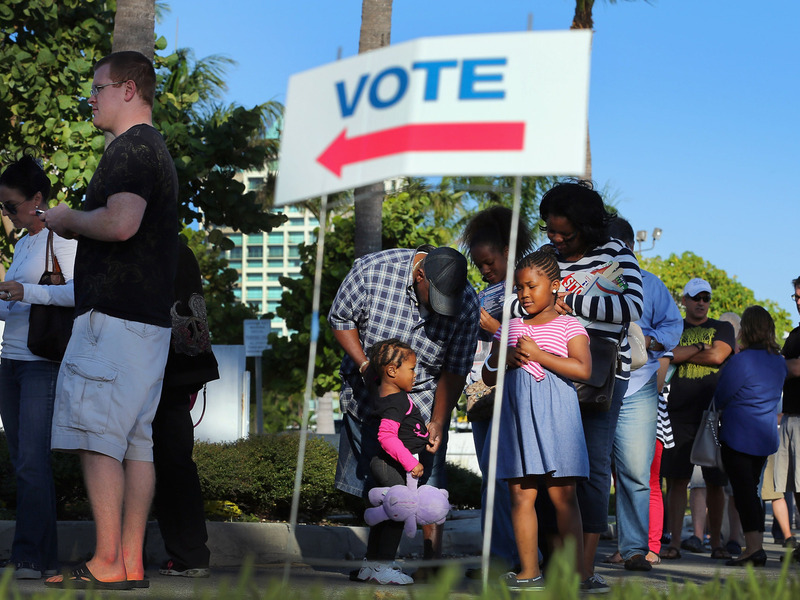 Early voters waited in line Wednesday in Miami. The campaign calm after the storm is about to end. Both President Obama and his Republican challenger, Mitt Romney, will be out stumping for votes today. The race for the White House, which was just about put on hold as Superstorm Sandy bore down on the East Coast and then roared ashore, is back on with just five days to go before Election Day. Romney will be in Virginia. The president will be in Wisconsin, Colorado and Nevada. "What has been a remarkable run of storm-related civility is now coming to an end. ... Asked if Romney will sharpen his tone Thursday, the Romney campaign told CBS News that Americans can expect the sort of tone that one would expect 'six days before an election' — that is, a nastier one than we've seen in the wake of Sandy. ... Mr. Obama also looks to be getting back to his anti-Romney message: A release from his campaign said he plans to 'highlight his second-term agenda to grow our economy from the middle out, not the top down.' "
On Morning Edition, NPR's Scott Horsley reported on the president's handling of the response to Sandy and his return to the campaign trail, and Ari Shapiro reported about how Romney has been dealing with the challenge of campaigning when many voters' minds are focused elsewhere. Over at It's All Politics, Alan Greenblatt looks at how "In Sandy's Wake, Romney Struggles To Regain Attention." We hope the candidates' return to the campaign trail doesn't make any more little girls cry.